I think I said in an earlier post that last week I read The Last Lecture by Randy Pausch. The book was an easy and wonderful read. Every chapter either moved me to tears or made me laugh. A major theme in the book was the importance of childhood dreams. Randy presented his childhood dreams and then went on to show how all of them (with the exception of one) came true. Even the absurd dream of wanting to be Captain Kirk came true in a round about way. It got me thinking about my childhood dreams. Being a wife and mother were definitely on the list. I’ve accomplished those. For a time when I was a kid, we had a ping pong table. We found that when the table was pushed up and stored it could be used as a chalkboard. We spent time playing school. Perhaps it was then when I decided I wanted to be a teacher. I did become one. Although I feel I am done with my time in the traditional classroom, I do not feel I am finished teaching. I know that I dreamed of being a published author, although I think I also dismissed that dream as being “impossible.” I also went through a phase where I desperately wanted to be a model. I’m not exactly sure why seeing as I wasn’t tall or thin enough…or even pretty enough for that matter. But I wanted it enough to give up a vacation to Hawaii so I could attend John Casablanca’s modeling school. I guess I just craved the spotlight somehow and that was the only way I could imagine being in a spotlight. Except for the fashion model fantasy, I don’t think I really dreamed BIG. I loved my life just the way it was and never really longed for much more. When I think of the activities that were my absolute favorite…those that defined my childhood it would be three things. I loved being a cheerleader and showing off my cheers to anyone who would watch. I loved playing Barbies and could spend hours on end in this fictional world of my imagination with Barbie and her friends. I loved drawing and coloring. The funny thing is except for cheerleading (which I participated in from 2nd grade through 12th), I’m not sure how often I did those other things. Maybe it was only a year that I was taken with Barbie and maybe my drawing obsession only lasted a few months. Maybe there were other things I did better and for longer, but those are the things I remember. When I visualize my childhood I see the Barbie Dream House, the spiral notebook in which I drew portraits of Strawberry Shortcake and all her friends, and my Godmother’s laughing face as I “perform” for her. Randy’s book definitely has me reflecting once again on my childhood dreams, talents, and hobbies. I do believe that what we are drawn to as children gives us clues about our future careers and lives. The dreams of our children should not be dismissed. I think that there are two kinds of jealousy. There is the kind that causes you to react. This is the jealousy that was illustrated in last Monday night’s episode of How I Met Your Mother. It’s a fearful jealousy that comes out of a belief that you are going to lose something. It often causes you to behave detrimentally. In that episode of my favorite sitcom, Jenkins tells Lilly that she has kissed Marshall and is very sorry. Lilly reacts with a jealous rage and clobbers her. 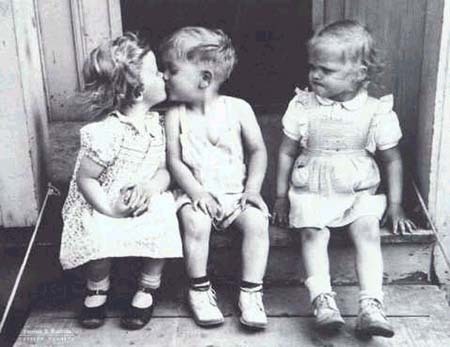 This kind of jealousy (as illustrated) fuels revenge and rage and keeps you completely tuned out from your true self. The conclusion Kelly came to during our conversation is that if you get jealous of something someone else is doing, maybe it is because you are meant to do it too. These days, every once in a while I’ll find myself feeling envious while reading a blog. I have attracted into my life so many charismatic and talented writers that I can’t help but be in awe at the response they illicit from their readers. Before I talked with Kelly about the topic of jealousy, I’d give myself a hard time for feeling the way I felt. Now I realize that it is a seed to inspire me to take action, practice, and improve my abilities. The next time you find yourself feeling envious, first figure out which kind of jealousy you’re feeling. Is it the kind that makes you angry? Is it the kind that makes you want to react (in a not so positive manner)? OR is it the kind that makes you excited and inspired? Does it make you want to act in a manner that will improve your standing in the world? Start paying attention to these feelings and asking the questions. It may just guide you toward a new hobby, talent, or career! A couple of months ago, I wrote this post about the theme song to the show Arthur and the value I found in it’s message. A new comment arrived this week on that post addressing the issue of believing in yourself. After a couple of exchanges with the commenter, I realized that it would be easier for me to share my thoughts in a whole new post. This post is to address my thoughts on self-esteem and the message that I take from that Arthur song. When I say that I want my daughters to believe in themselves it means I want them to connect with and follow their Higher Selves. I believe we all have souls (or are souls) and that that part of us is innately good. I believe it is there that we find our connection to Divinity (aka God or The Universe). At the core of us is an internal guidance system. It is the way God speaks to us. It leads us to our true path and away from the things that will harm us. When we trust our gut and our instincts, the results are almost always good (though sometimes it is a long-term good that we don’t see immediately). This part of us has the best for humanity in mind. If we are in touch with it, we will find that we feel compassion and empathy for others. When people around us are happy or hurting we feel it. When we pass a homeless person on the street it is this part of us that compels us to offer money or send a blessing their way. It is our higher self that urges us to reach out to the kid that doesn’t fit into the crowd. It urges us to stop and move a turtle out of the middle of the road or help a stranded driver on the highway. Our higher selves signal us when we have an inspired idea. We engage with our higher selves when we enter “the zone” while doing something that we are talented at. This is what I think of when I hear the opening song to Arthur. I want my girls to believe in their Higher Selves. What I am not talking about is EGO. There are a lot of kids that have been taught to believe in themselves and in turn have become ego-maniacs. The measure of success becomes material rewards at all costs. I am currently watching the show “Breaking Bad” and there was a minor character on it who was the perfect example of someone with this kind of high self-esteem. The guy pulls into a parking lot driving a BMW convertible. He cuts in front of “Walt” and steals a parking spot. He gets out of the car speaking very loudly on his cell phone. During his conversation he talks about how great he is and how he will definitely get the promotion at work. Then he sees a pretty woman and makes a shameful comment about her appearance and proceeds to announce what he’d like to do to her. This was a fictional character who represents a great many people in society. I’m sure they believe in themselves and are very confident, but also cut off from their Higher Selves. I hope that through my example, I can teach my daughters to take the time to connect with their inner guidance system. I want them to uncover their talents and find success. I want them to have enough faith and self-respect to walk away if their peers ever encourage them to do something harmful. I want them to feel love without needing the constant approval of the people around them. I want them to be wise, discerning and brave…not selfish! Last week I added this song, by Gavin DeGraw, to my Ipod. I listened to it at the gym while riding the spin bike on Monday afternoon and a wave of emotion rushed over me. I even got tears in my eyes, which luckily blended in with the sweat rolling off my brow. I have been working for quite a while now on finding my place and purpose in this life and most of all my connection with God, but as you could probably tell by yesterday’s post, I’ve been hit with some blows. Those blows of course came in the form of criticism. I am trying very hard these days to care about myself without being selfish and to be filled with gratitude always. Last week someone called me both selfish and ungrateful. It hurt a lot but it has also made me take a look at my life and decide who I have to please here.